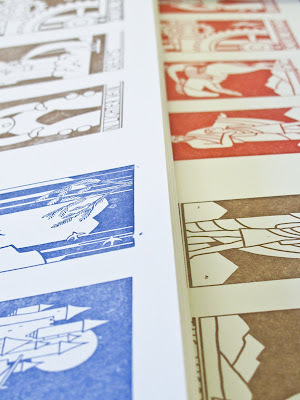 A few weeks ago I printed covers for a new set of my art deco mini journals. 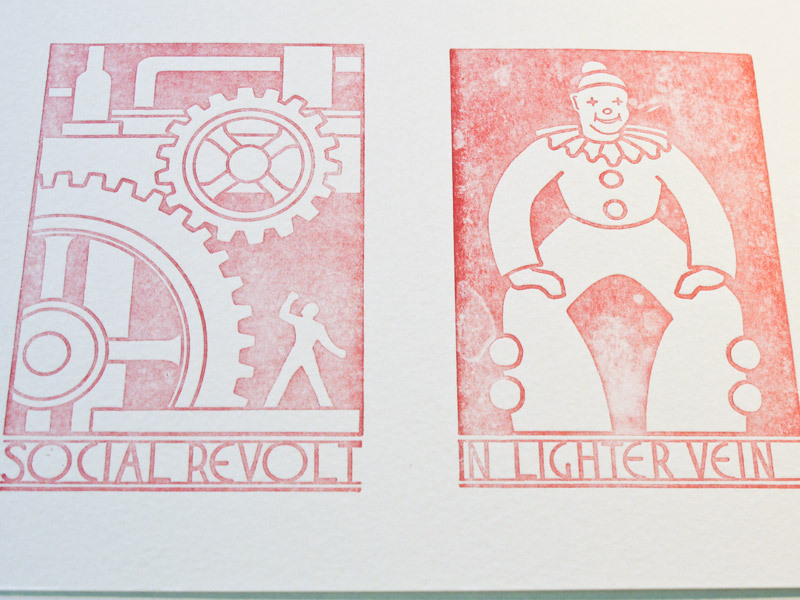 The illustrations come from antique metal plates I purchased a few years ago. What better opportunity than to snap some photos and walk you through the process of letterpress printing with antique cuts! First I had to cut down paper. 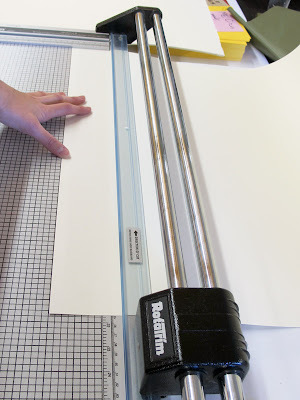 I chose to print the images on sheets of Revere Suede 100% cotton paper which comes in 22 x 30 inch sheets. I had to cut each down to 4 x 22 inch strips on a giant slide trimmer. This took about 45 minutes. 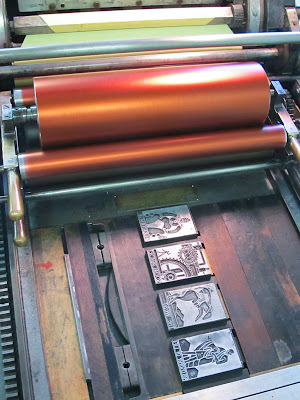 Next I had to set up the form in the press-bed. This is usually the most time consuming part of the process and takes some planning, measuring, and troubleshooting. 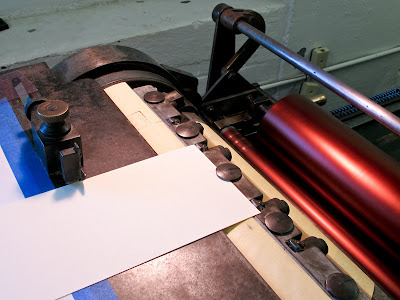 You start with an empty press (above) and must arrange everything between "furniture" which are varying sized pieces of wood and metal to "lock" the form in tightly so nothing moves when printing. After an hour or so the form was "locked" in. 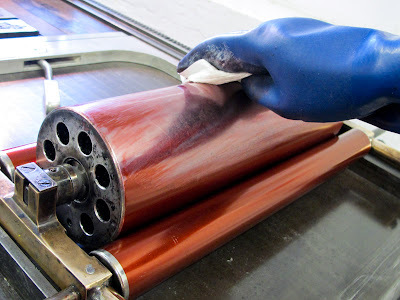 Then I mixed red ink and put it on the large metal roller which disperses the ink to rubber rollers beneath called the form rollers. I aligned my first sheet of paper into the grippers (those big circles) and the image was inked onto the paper. But I still needed to do more adjusting. My image printed too light. Which meant I needed to add another layer of "packing" to the tympan, which is the yellowish paper on the feed cylinder. After some tweaking I managed to get a decent print and ran all 80 sheets of paper in red. 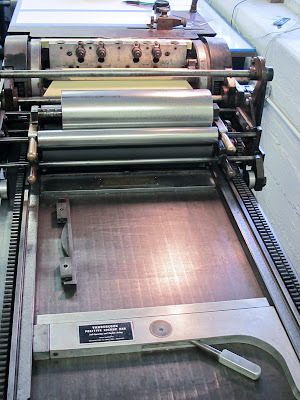 Then the ink needed to be cleaned from the press so I could switch to printing in brown and blue. Cleaning the press is my least favorite part. 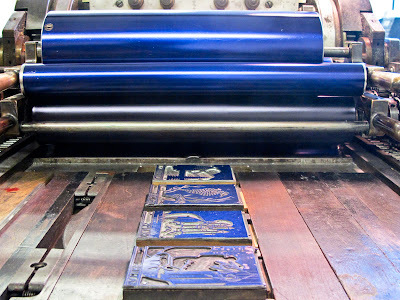 It takes about 20 minutes and a solvent must be used because the inks are rubber based. We use Citrus Solv which is slightly less toxic then the more standard California Wash.
Then the process is repeated for both blue and brown inks. Though the form basically can stay the same with different plates being switched out in the new colors. In the end this took about 6 hours to complete, with a short break for lunch mixed in. That was about 2 more hours than I thought it would take. But letterpress is full of surprises and challenges so I always take longer than what I anticipate. Despite that I can't wait to get to put these little guys together. They'll be making they're debut in new colors with a few new illustrations this holiday season! 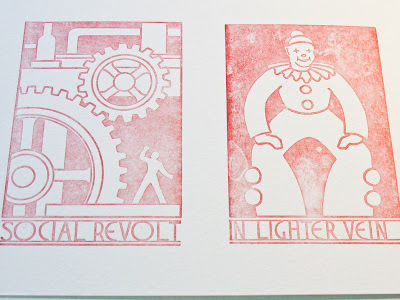 Loved seeing the process and learning about the time and effort that goes into letterpress. Great post! Wow. This is fascinating. Thank you for this insider glimpse into your process! Thank you for sharing the process. 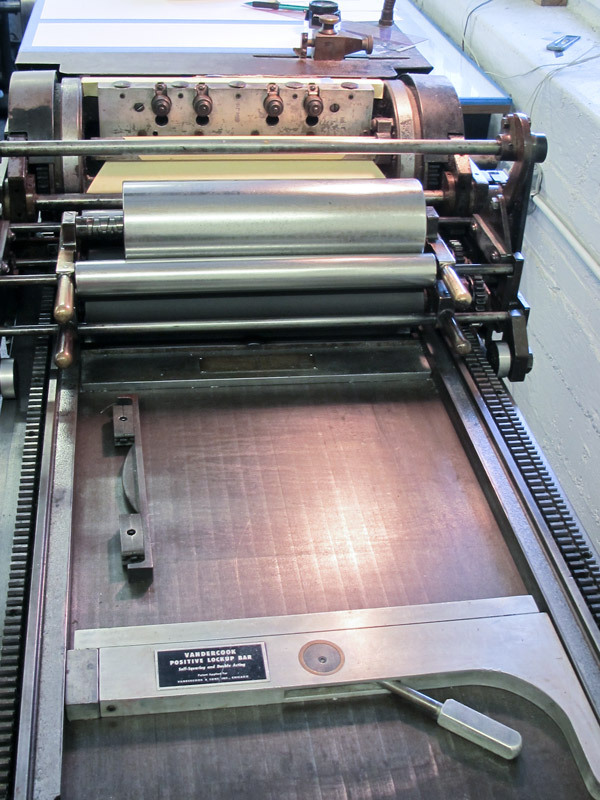 I don't think I am up for it but at work we have some old metal plates and my boss would like to see them printed, could you tell me what type of ink I can use?